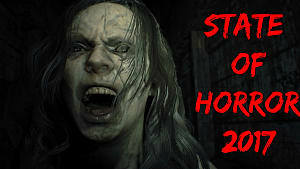 Forget Mass Effect, Zelda, or Call Of Duty: for me, the slow crawl through the beginning of 2017 has been all about Red Barrels returning to the defenseless horror genre. 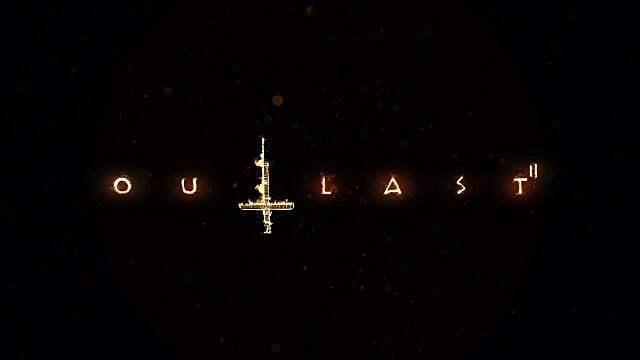 I was absolutely gutted when a several month delay happened at the 11th hour back near Halloween 2016, but now Outlast 2 is here and ready to scare your socks off. While the first game flirted with disturbing religious themes, but then took a very sudden, very hard left turn into sci-fi at the end, this time around, we get what's been advertised with the logo and trailers. The religious themes are much more fully explored in this sequel on two different fronts. Now THAT'S how you start a game! Rather than investigating an asylum in need of shutting down, this time husband and wife duo Blake and Lynn are looking into the mystery of young pregnant woman who was found dead. Before long the two are separated and things go quite badly for all involved when stumbling upon the locals. Backwoods forests and caves aren't the only environment however, as supernatural danger arrives in unexpected ways. First there are the religious fanatics the main character is being hunted by, and then there are (equally dangerous) flashback segments to Blake's time at Catholic school as a kid. As someone who had to attend private religious school myself, this aspect of the story really resonated with me: for everyone else, your mileage on that front may vary. The present danger is likewise split into two different factions: one side hyper fundamentalist, incredibly violent Christian hillbillies who worship the evil Knoth as a prophet and sort of secondary savior, and the other side consisting of heretics who have left the backwoods Vatican to follow their own equally crazy faith. Needless to say, the two don't get along, and it's flaying, crucifixion, and burning alive all around for everybody! If you like to dig into the lore and backstory, just simply listening to Knoth's unholy sermons, and the mad sense they make if you take certain theological concepts literally or run them to their ultimate conclusions, is a pretty wild ride all on its own. With the new enemies come an updated UI and new mechanics. The camera of course remains, but there's additional elements to that system now, like recording video segments on story-important scenes. What's interesting is that lot of those scenes can be missed. Not only does this add something else above and beyond what was in the first game, but it also takes care of an issue that was a deal breaker for many before: replayability. Some of those special video recording segments are cleverly hidden, and others can only be found at specific time intervals. 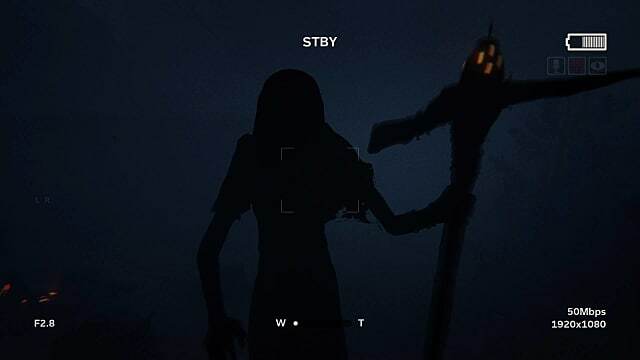 Unlike with the first Outlast, which is essentially just something you pull out at Halloween to scream for a night, there's now a reason to play through Outlast 2 more than once to search them all down. 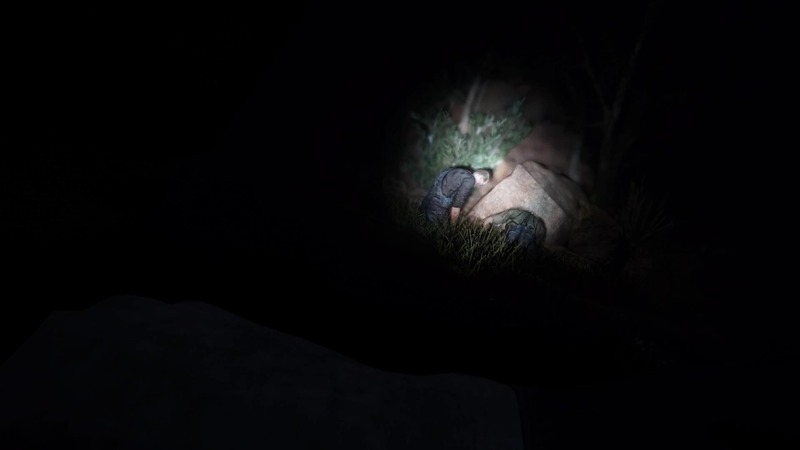 The camera has an extra microphone feature as well for listening through walls or across fields so you can try to time your sneaking better when patrolling enemies are on the move. Some additional objects to interact with, a series of quick time events, and significantly more places to hide from enemies all increase your options on what can be done from the previous game. I might be the last person to realize this was a possibility since I usually never play my PS4 at night with all the lights off, but I was also amused to see the PS4 controller's light changes colors when you switch to night vision on the camera. It's a little thing, but it adds a certain something to the atmosphere. 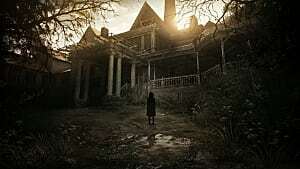 Without question, this a game that earns its "M" rating in every conceivable way, from the story twists to the overall themes to the gore and even in the many documents discovered while searching this backwoods hamlet. The people there have a rather unhealthy fascination with all things sexual, which is expressed in some horrifying ways. Children -- normally off limits in the typical horror story -- are also murdered with wild abandon at the behest of the unhinged Knoth. Back in October there were a couple of issues in the demo that had me concerned, but those were all handily dealt with in the final version, with the areas much more well fleshed out and the story coming together much more cohesively. 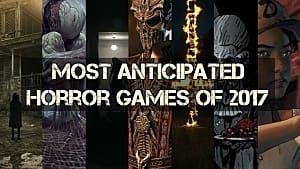 There are other issues that have popped up in this final release version however, and some of them were quite unexpected. 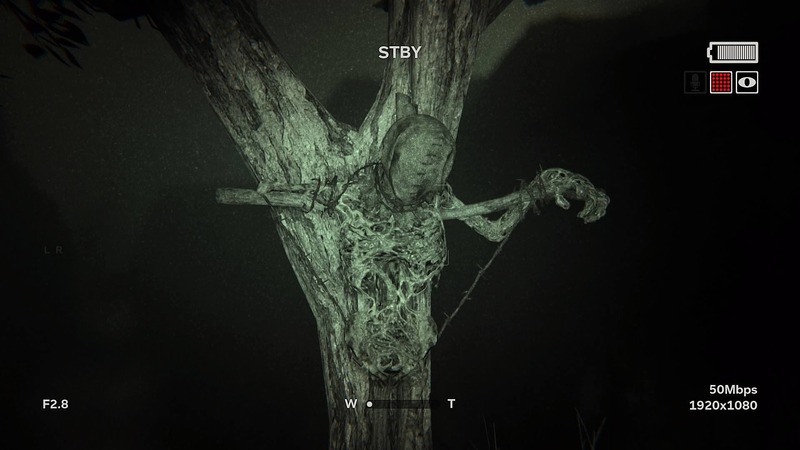 The Outlast experience is all about either hurling yourself at top speed away from danger, or sneaking around trying to avoid something awful. To keep those two themes going, you need a major villain that makes the player go "nope, not even gonna try fighting, I'm just gonna run the other direction." 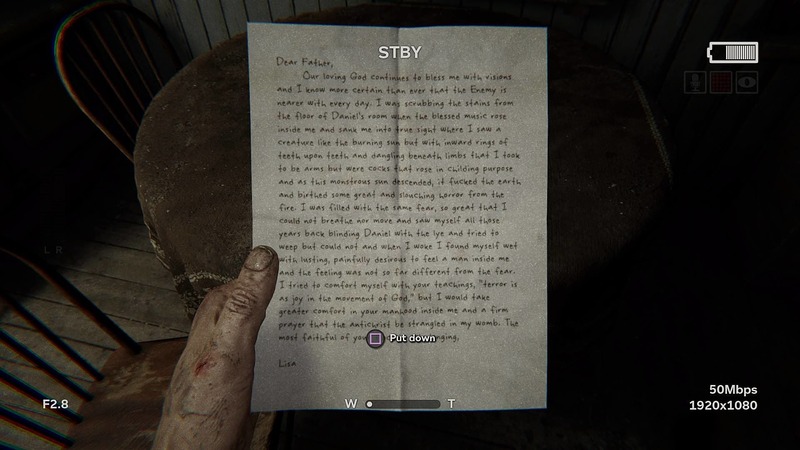 Unfortunately, we don't always get that in Outlast 2. The first time the robed character Marta appeared out of the misty darkness, I did in fact literally shriek and involuntarily stepped backward, just because I wasn't expecting it. As she continues to be the main "big bad" that chases you around a major portion of the game though, it slowly dawned on me: she really lacks the visceral terror of the antagonists from the previous game. Those two naked brothers, whispering all the terrible things they'll do to you why stalking about the darkness with long knives, were absolutely horrifying. The enormous mutated Walker had an aura of menace, and his kill sequences -- literally popping your head off -- were so unpleasant I ended up closing my eyes for several of them. That's not really the case here with Marta, who has a creepy vibe with her glowing pick axe, but just doesn't have the same fear factor. It only takes two or three times being killed before the effect really wears off. On the plus side, there are bigger areas here from the first game, and that's an excellent change. The methods for escaping or sneaking around have improved quite a bit, with better mechanics and more overall options. That being said, there are still some times where frustration is sure to ensure when there's only one specific place to go to escape an area, and it's not always clearly defined. Unless you are extraordinarily lucky, there are three chase sequences in particular you can plan on doing four or five (or more) times while swinging the camera around wildly trying to figure out just exactly where they want you to go. 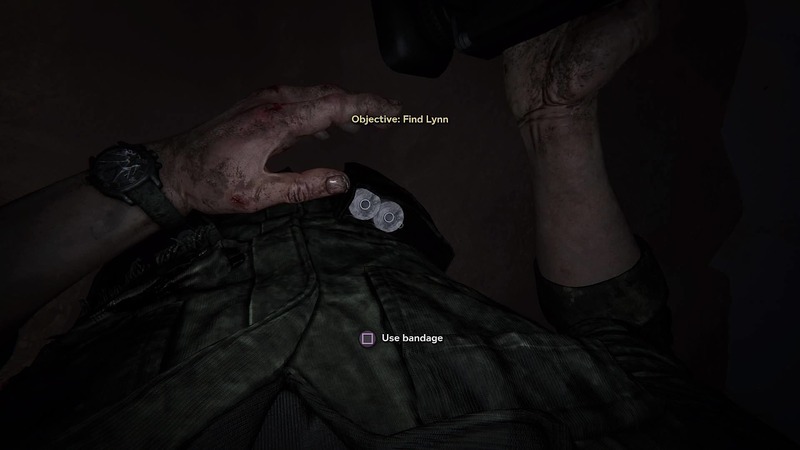 These instances take the player from fear to annoyance, and that was really my only serious complaint about the first game as well, so hopefully that's a kink that can be worked out in the future without going too far into casual hand holding territory. 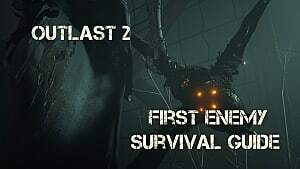 Just due to release date proximity, Outlast 2 is inevitably is going to be compared to Resident Evil 7 (which itself borrowed liberally from Outlast and Amnesia in style). Both have their strengths and weaknesses, acting as mirrors of the other, and frankly both are worth playing. 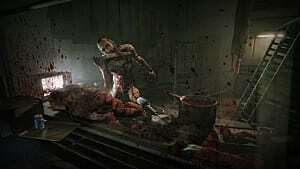 Where Outlast 2 shines above RE is in having puzzles that make sense within the context of the game world (rather than puzzles for puzzles sake, like with Resident Evil 7), and in maintaining the defenseless style the entire time, never descending into action combat with boss fights. 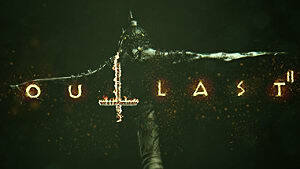 For the horror fans, Outlast 2 is filled to the brim with fabulous imagery, like a river of blood rushing down a school hallway, or a room where dozens of murdered infants have been discarded, draped by beams of light in the shape of a cross. The game is practically screaming for VR capability, and would make for one hell of a terrifying experience. Lack of VR aside, if you loved the first game, you'll want to play this one without question, even if it does have a few problems. The squeamish and the easily offended need not apply.